Like attractive design ? Need a spacious interior ? want modern technology, but don't want to break the bank ? Say hello to Dacia Sandero. Beneath its svelte form lies ample space for five adults. A split-folding rear seat and 320 litre boot make transporting luggage simple. Electronic Stability Control, anti-lock brakes and four front airbags ensure safety as standard. And, with Sandero Laureate, air conditioning and cruise control mean maximum comfort on the move. Want cutting-edge design ? No problem. There's the state-of-the-art TCe 90 3-cylinder petrol engine, which combines impressive performance with frugal fuel consumption and CO2, emissions of just 116 g/km. Which means savings for you and the environment. 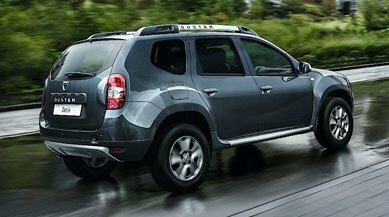 At Dacia, we believe in giving you the choice to pay only for what you value. That's why our comprehensive standard 3 year / 60,000 mile* warranty may be extended up to 7 years / 100,000 miles*. Our simple range offers three trim levels to suit your individual needs : from the affordable Access to the luxurious Laureate. And, with prices starting from just £6,995 on-the-road, there is a Dacia Sandero for everybody.